I just came across this photo gallery on Life magazine’s site by photographer Craig Cutler titled Shoes of the Very Famous. It’s pretty incredible how iconic some of these are and how much personality they exude. 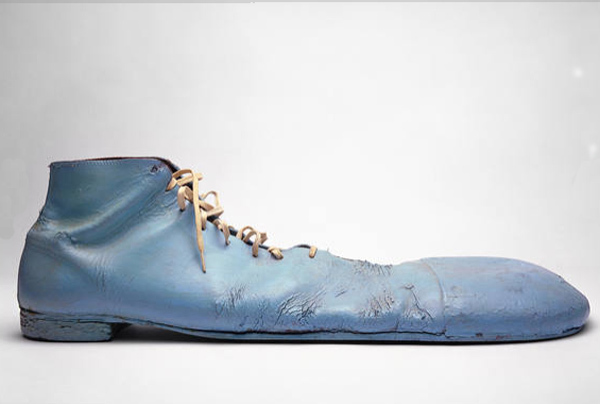 After seeing Dave Eggers’s shoes, I can’t believe I was worried about a little hole in mine! From top to bottom: Bozo the Clown (1960-84); Rudolf Nureyev (1960s); Madonna (1992); Mario Battali (2011); Dave Eggers (2011); James A. Lovell Jr. (command-module pilot Apollo 8); Princess Diana (1986); Dalai Lama (2010). You can see the rest of the gallery with more information at Life.com. And you might also like Craig Cutler’s Artist Series; portraits of, you guessed it, artists. This entry was posted in Art, Fashion, Fun, Pop Culture. Bookmark the permalink.